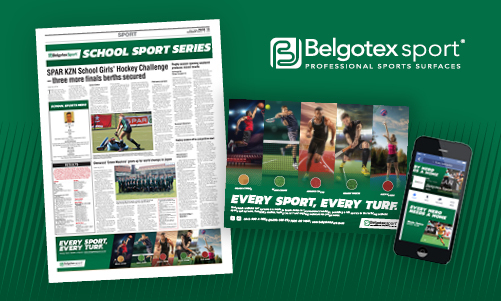 Coffee Creative Studio is involved in an integrated campaign for Pietermaritzburg based Belgotex Sport this year, which includes a closely linked combination of print advertising and social media management. The Belgotex Sport range of multifunctional turf includes Evergreen fields for a wide variety of sports. From hockey to soccer, netball, tennis, golf, cricket and even bowling, this range was created with sports in mind. To bring home the versatility and quality of this multi-use turf, we created an integrated campaign to be used both in print and on social media. Both of these elements were created to showcase Belgotex Sport’s commitment to both quality and school sports. Making use of Belgotex’s slogan, the Every Turf, Every Sport payoff was created for the Daily News to run simultaneously and with relevance to the featured hero of the week. This ad reminds fans that Belogotex offers far more than astro-turf. The huge variety of sporting fields that the brand caters to is equal only to the variety of custom turf solutions offered by the brand. It is this versatility that has made Belgotex Sport one of the foremost artificial field providers in the country. At Coffee Creative Studio , we pride ourselves on helping clients reach their goals through highly personalised design solutions. Our advertising solutions are designed to get the message across in a clear and concise way, using powerful images, smart design and on-point copywriting. Careful research is done before starting any design project, to ensure that our message is perfectly suited to your target audience. Advertisements are designed according to best practice, so that they are tailored according to the medium. Whether it is a banner advert for a local paper, a full size campaign for a magazine advertorial or an expertly crafted social media banner, we will work with you each step of the way to ensure that your message is brought across in the best way possible. Our team of designers are highly skilled in their field, with extensive experience that is backed by powerful portfolios. If you would like to learn more about taking your print and social advertising design solutions to the next level, contact Coffee Creative Studio today and let us know how we can assist with your campaign.